When you think of the perfect Minnesota getaway, what do you picture? At the very least it probably includes that peaceful, incomparable lake atmosphere, the sun setting on the water. Tranquility, restfulness, great memories. These are what you'll find at any of the resorts on this list. Whether you head to Boundary Waters or Detroit Lakes, these Minnesota resorts are perfect for the whole family and provide that unbeatable lakeside life. You and your family will never forget it! Kavanaugh’s Sylvan Lake Resort is a family-owned paradise. That's why they take such pride in giving you the vacation experience you're looking for, and it's why they're number 1 on this list. Providing you the excellence and service you deserve is more than just a goal, it's a family tradition. At Kavanaugh’s Sylvan Lake Resort, located a few miles outside Brainerd, you'll have several accommodation options like "The Oaks" or "The Maples," cabin options that vary in size, but don't differ in quality. 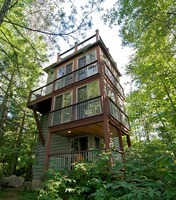 Every cabin and condo at Kavanaugh’s echoes that Northwoods feel and is designed for your enjoyment. You'll have fully equipped kitchens, as well as internet and laundry facilities at your disposal. There's also over 4,400 feet of trails for bikers and hikers, as well as photographers and nature lovers to enjoy. This is a place that the whole family can enjoy. And a place to make great memories you'll never forget! Don't miss a chance to cast a line (or two) when you stay at Kavanaugh’s. Of course, there's Syvlan Lake, but there are also lots of other lakes to fish on nearby as well! Dade, Steamboat, and Wilson are some of the closest! From I-94 west to Clearwater, exit on Hwy. 24 then go east to Hwy. 10. Head north on Hwy. 10 to Little Falls. At Little Falls take Hwy. 371 north to Brainerd/Baxter. At the intersection of Hwy. 371 and Hwy. 210 continue north 2.2 miles to Co. Rd. 77. Go west on Co. Rd. 77 for 6.5 miles and turn left at Kavanaugh's sign. Stressing family, fishing, and fun, Ruttger's Bay Lake Lodge is your premier Minnesota lake resort! Set on the sparkling shores of Bay Lake, the family will find plenty of aquatic adventures, along with on-land outdoor fun! A diverse selection of lodging options means that your Northern Minnesota getaway can accommodate even the largest families! Family-operated since 1898, this resort truly has perfected the craft of family fun. Head down to the lake for swimming, boating, and (of course) fishing. Shove off on a family fishing trip or recruit the help of distinguished fishing guide Lynn Harker, who will share his hot-spot secrets. The marina teems with water-fueled fun. Explore the shores on a pontoon, rowboat, sailboat, paddleboat, kayak, or water bike. Stay dry hiking through the lush nature trails, swinging away on the resort's championship golf course, or shopping at the unique stops. Villas, condos, cottages, and houses are equipped for families of all sizes and feature amenities like fireplaces, private decks and patios, Jacuzzi tubs, and more. Your family fun center awaits! The Cuyuna Lakes Mountain Bike Trails are only eight miles from Ruttger’s. The 22-mile trail winds through a rugged area created by 70 years of former iron ore mining. Swing away on The Lakes, the resort's 18-hole Championship golf course. Carved from 100 acres of rugged northern woods terrain, each hole will offer you a challenge as well as the scenic beauty of Northern Minnesota. An all-season resort for all ages awaits at Kohl's Resort! Families will discover an oasis of outdoor adventures, lakeside leisure, and cozy cabins all in the breathtaking Northwoods wilderness. Dive into the lake and bond with the ones you love in the shadow of Buena Vista State Forest! The aforementioned body of water is Big Turtle Lake, a 1,500-acre water wonderland teeming with crystal-clear water. Set off on a family fishing trip, have fun water skiing, or dive in for a swim. The sunny beach shores are the perfect place to build sand castles or catch a tan. Stay on land and enjoy hiking, biking, and much more. When the fall arrives, hunters will find plenty of game while the winter is perfect for snowmobiling and cross country skiing. You'll find just as much fun onsite, where an indoor swimming pool, a relaxing sauna, and and outdoor Jacuzzi hot tub. Cabins and a spacious lodge can accommodate families of all sizes. Sprawling decks showcase lake views, fireplaces warm frozen fingers after a day of exploring, and screened porches are the perfect place to kick up your feet. Splash around in the lake or explore the area together! Big Turtle Lake is part of a seven-lake chain and 30 minutes from 30 different lakes. It's safe to say the aquatic adventures are always in full supply! When the water freezes over, enjoy the lake in a different form. Bring your own ice house and reel in muskie, walleye, northern pike, crappies, or panfish! Your family will be absolutely blown away be the resort's wealth of things to do and see. In Gull Lake's waters you'll find boundless enjoyment via the 10,000 acres of water sports playground with miles and miles of shoreline to explore. Make sure you check out the sandbar for fantastic sunbathing! Meanwhile, parents will love the newly refurbished 12 lakeside Lodge Suites, new terraced landscaping, and the new 96 slip dock system! Quarterdeck may have "quarter" in the name, but you'll have all the fun! Located on Pelican Lake in Orr, Minnesota, Birch Forest Lodge is the perfect destination for a family fishing trip in Northern Minnesota. With over 1,000 feet of amazing lake shore and newly remodeled cabin rentals, you simply can't go wrong! The first thing to do when you arrive at Birch Forest Lodge is get out on the water. It's never been easier as the lodge has rentals available for all of your aquatic needs. Did you bring your pole and tackle box along with you? Take out the fishing boat complete with swivel seats, a depth finder, and live well. The upgraded deluxe fishing boat has a 60 HP motor and is great for tubing. Or, you can spend a lazy day on Pelican Lake with a pontoon voyage. Make sure to enjoy the scenery along the way! Off the water, the resort is full of fun activities and amenities that everyone in your group will enjoy. The outdoor playground is a great place for the kids to run around, or you can all play a game of horseshoes, basketball, disc golf, or even water volleyball. After a successful day on the water, you can clean and grill your catch right onsite. Head to the game room for some billiards or to catch the big game on the satellite television. After a full day of fun, retire to your comfortable cabin accommodations. The knotty wood interior gives each unit a truly authentic Northwoods feel, something you'll remember long after you've paid your last goodbyes to the lodge. The Orr Bogwalk is one of the region's best known interpretive trails. A short mile stroll on a well maintained boardwalk takes you and your family into the heart of a living bog. Birch Forest Lodge was originally founded in the 1930's. Located in the heart of the breathtaking Brainerd Lakes region, Pine Terrace Resort offers aquatic activities for all ages! This secluded stay offers both tranquility and a host of recreation options just outside your door. Whether you want to dive into the lake or just sit back with your family, this lakeside lodging is your ticket to paradise! As the only resort situated on the shores of the idyllic Star Lake, you'll find plenty of privacy and a wealth of water adventures! Cast off on a family fishing trip, paddle along the wondrous waters on a kayak or canoe, or try something different like paddleboard rides and water bikes. Construct sand castles or catch a tan on the sun-soaked beach. Bring your own boat and take advantage of the private boat ramp. Stay on land and explore the resort's scenic 36 acres with tree-lined hiking trails throughout the property. Once you've had your fill of fun, return to your lakefront cabin and soak in the serenity. Lounge on your deck and enjoy the lake views, fry up a family meal on the outdoor barbecue grill, or kick your feet up on the dock. These luxurious cabins feature spacious living room areas and wood-burning fireplaces. What are you waiting for? Bring your family to this untainted piece of paradise! Star Lake is surrounded by towering pines and birches and offers plenty of options for fishers like largemouth bass, northern pike, sunfish, and crappies. Star Lake is one of the six connected lakes known as the Ossawinamakee chain of lakes, located just south of the Whitefish Chain of Lakes. There's plenty of water to explore here! Northern Lights Resort, Outfitting & Youth Quest welcomes families to a waterfront oasis on the shores of Lake Kabetogama. Located on a secluded bay with 16 acres of wilderness and expansive shoreline, the lake adventures are just outside your door. Kids can build sand castles on the sun-soaked beach or play around on the Floating Water Park. 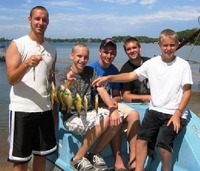 Enjoy a family fishing trip on the pristine lake, which offers some of the best fishing in Minnesota. A large selection of boat rentals will get the fun started. The entertainment never ends on this lake, which is one of four major lakes that makes up Voyageurs National Park! When you're not on the lake, try hiking through the tree-lined trails or playing beach volleyball. Youth Quest activities keep the little ones entertained with arts and crafts, kayak lessons, scavenger hunts, minnow races, magic tricks, and much more. One- to five-bedroom cabins offer plenty of space for families of all sizes. Enjoy amenities like Jacuzzi tubs, fireplaces, barbecues, decks, and much more. Families will find a boatload of lake adventures here! 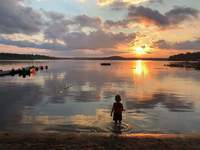 Showcasing 25,000 acres of pristine water, Kabetogama Lake offers almost endless aquatic exploration! When you're not on the lake, have fun playing ping pong, foosball, and lawn games. When the sun falls, roast marshmallows around the bonfire! Peer through the pines and birches of the Chippewa National Forest and you’ll discover one of Minnesota’s best hidden gems. Moore Springs Resort is everything you could want in a family vacation: activities to do, things to eat, and memories to make. The serene spring-fed Howard Lake makes a thrilling venue for dozens of lake-related activities. Before you even get into your room, your family will want to get to fishing, swimming, and canoeing around its crystal-clear waters. For 107 years, Moore Springs has had guests return again and again, entranced by the site’s beauty and the employee’s fantastic hospitality. Get outside and go hiking in the Chippewa National Forest or biking the Heartland Trail or the Paul Bunyan Trail- it’s a trip your family won’t soon forget! You want a place to really get away from it all? Well, then look no further than Ludlow’s Island Resort. As you may have guessed from its name, it's on an island. No, not metaphorically. A real island, surrounded by water. Making the whole island, and the lake surrounding it your play ground. With private cottages, and the island reserved exclusively for guests of the resort, this is the place to enjoy unparalleled privacy as you enjoy the relaxing lake atmosphere. Whether you simply want to enjoy your cozy cabin, or head to the beach, at Ludlow's either is a great choice! At the beach you'll be able to use the resort's kayaks and canoes, or you can just work on your tan! If you want to go fishing, supplies are available for that too! 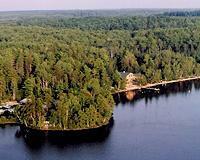 Lake Vermilion is known for its walleye, smallmouth bass, northern pike, crappie, panfish, and muskies. There are so many aquatic adventures at Lake Vermillion! Throw in a fishing line, cruise the shores on a pontoon, or paddle the waters on a canoe! Minnesota is chock-full of lakes, each featuring its own habitat, charms, and fans. At the top of the “Best-of” list is Elbow Lake, a glistening paradise that serves as an incredibly fun escape for families from all over the midwest. Get to Cook for an authentic family cabin weekend! Whether you’re cannonballing into the lake or roasting marshmallows over a crackling fire, the fun doesn’t stop at the Elbow Lake Lodge. 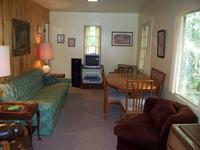 One, two, and three room suites available, or (for big families) grab a rustic cabin. When you aren’t getting cozy in your dwelling, go for a boat ride or play 18 at the lodge’s own mini golf course. Even the most scatterbrained kids will be able to focus on just how much fun they’re having! The city of Cook was initially known as "Little Fork", because of the river that runs through the city. River Point Resort & Outfitters Co. can provide you and your family the lake getaway you've been dreaming of amongst the beauty of the North Woods. In addition to being located in the midst of more than a million acres of Minnesota wilderness, the award-winning River Point Resort is also the only Ely resort and canoe outfitter on the northern, more intimate half of Birch Lake with direct water access to the Boundary Waters Canoe Area. Along with the impressive title come equally impressive cabins, luxury homes, and villas. Inviting Northwoods décor such as knotty pine kitchens and living rooms and a wood-burning fireplace make up the interior of your MN family vacation. Outside, you can get your feet wet on the Aqua Jump Swim Raft or stay on land for a game of bocce ball. Possibilities are endless with kayaks, paddle boats, minnow buckets, an outside fireplace for bonfires, two sand beaches, a marina and more! Set on the sparkling shores of Little Whitefish Lake, your family will have immediate access to aquatic adventures. Whether you're casting off on a fishing expedition or exploring the waters on a boat ride, you're sure to fall in love with this crystal blue water. Overlooking more than 230 acres of water, this lake opens up into the 13 other lakes of the Whitefish Chain. If you'd prefer to stay dry, hike through the lush Minnesota wilderness. After a fun-filled day, return to any of the 13 deluxe cabins and kick up your feet. 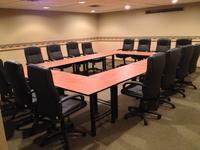 Accommodating anywhere from six to 16 guests, you can bring the entire family. All cabins include decks, picnic tables, and satellite television, and breathtaking views of the water. Life is better on the lake! Over the years, the resort has grown from six small cabins to the current 13 deluxe lake cottages complete with fireplaces and decks, yet it has remained devoted to great customer service. Large families can stay at The Deck, a six-bedroom, two-story stay that can fit up to 16 guests and features knotty pine interior, a deck, and much more! Set on 18 acres of Chippewa National Forest land and flanked by a Big Boy Lake harbor, Timber Trails Resort seems like something out of a dream. It doesn't have to be- make it a reality! In the hot summer months, families from all over the country flock to Timber trails simply to experience an authentic Minnesota cabin vacation. Many choose to hit the swimming beach, where swimming and tanning are always prevalent. Others grab a bout and head out onto Big Boy to test their angling prowess, searching for Walleye, Northern Pike, and Crappie. Whatever you choose to do, your cabin will be cozy, rustic, and full of the love and care that Timber Trails puts into every aspect of their resort. There's no need to stop to buy a hunting, fishing, or boating license; they have it all covered! Combining spectacular hospitality with superb accommodations, Upper Cullen Resort will quickly become your family's favorite place! If it's a scorcher outside with high temperatures and plenty of sun, you'll either be cooling off in the lake or relaxing indoors with your A/C on. The three-lake Cullen chain boasts some of the most consistent fishing in the area with an abundance of panfish and plenty of trophy walleye and bass. Meanwhile, nearby Nisswa and the surrounding Brainerd Lakes Area offers a plethora of exciting and diverse activities for families to take part in. You're just minutes from numerous area golf courses, unique shopping, great dining, entertainment parks, and the famous Paul Bunyan Trail. If you love fishing, try your luck at landing one of the abundant northern, bass, sunfish, bluegill, crappie, and walleye! 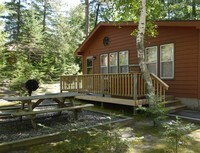 Each cabin has it's own campfire ring and picnic table, so get outside and enjoy the beautiful scenery! Enjoy free weekly activities during the summer season, hay wagon rides, a convenience store with game room, minnow races and so much more. Some units also have wood burning fireplaces, perfect for staying warm during a chilly Minnesota evening. Your next family summer vacation would be well spent at Tamarack Village in scenic Ely. From their pristine location to their unbridled enthusiasm for customer service, Tamarack has honed their craft catering to families for decades. Come and discover it for yourself! In those blisteringly hot summer months, liquid relief is often the best medicine. And while most families might seek out water parks and pools, the crowds and chlorine can often be unbearable. A lake vacation is the superior choice, and Tamarack village, resting right on the edge of the Boundary Waters Canoe Area Wilderness, is one of the best. Featuring water clarity of up to 16 feet and more than 150 islands, the lake is perfect for fishing, canoeing, and swimming. Get in the water for a refreshing dip, or grab a good book and settle in for a relaxing afternoon. You’re gorgeous cabin will be waiting for you at day’s end. Ely is 2.74 sq miles. When it was discovered that the town's orignal name (“Florence”) was already taken by another Minnesota village, “Ely” was chosen in honor of mining executive Samuel B. Ely. There's adventures for all ages at Hiawatha Beach Resort, a family-owned and operated fun center on the sparkling shores of Leech Lake. Set off on a fishing trip together, paddle the scenic waters on a kayak, or make a splash with a swim. Explore the shores on your houseboat and then stop at the docks before enjoying a tanning session on the sun-kissed beach. As one of Minnesota's most significant bodies of water, Leech Lake is teeming with fun! And you get to serve as captain of your vacation on these spacious houseboats. Up to 10 people can stay on the boat and enjoy such amenities as a swim slide, a large patio, and a barbecue. Enjoy fresh fish on the grill as you maneuver through the beautiful waters. With so many creature comforts, these houseboats will make you feel right at home! In addition to stunning scenery, Leech Lake also offers an array of fish species such as walleye, musky, crappie, bluegill, perch, and largemouth bass. The little ones fill find big fun with weekly activities like rocket building and launching, scavenger hunts, and kids' fishing trips. 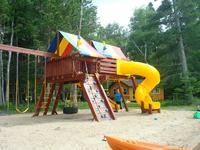 Located on the shores of Boot Lake, Half Moon Trail Resort is an ideal destination for family adventures of all kinds. Here, you can unwind together with your loved ones in a refreshing, natural setting, with spacious cabins are equipped with modern touches such as full kitchens, decks, picnic tables and Weber grills. When you're not relaxing indoors, you'll find a variety of exciting activities waiting just outside your door. Their onsite beach area is perfect for the kids to play and swim at their leisure; or you can head out together for a family fishing trip. Teeming with walleye, bass, crappie and more, you're sure to reel in a trophy catch. The resort offers kayaks and hydro-bikes for water fun, plus a row of chase lounge chairs along the shores if you're looking to catch a tan! And that's only the beginning. Half Moon also offers fun family events including potluck suppers and evening campfires, complete with kettle corn and s'mores! Plus, activities such as pool and carpet ball tournaments are great way to spend afternoons together as a group. No matter how you choose to enjoy your getaway, this is sure to be a family outing you won't ever forget! The Park Rapids area is full of outdoor recreation options that's sure to appease adventurers of all ages. Head over to the beautiful Itasca State Park and check out the headwaters of the Mississippi River or enjoy a refreshing biking trip together! Half Moon Trail Resort caters to families! When you're not out at the lake, you'll find plenty of other onsite amenities to keep you entertained. A swimming pool, playground, sand volleyball, horseshoes, ping pong and video games are available for your enjoyment! Named after the Muskego tribe of the Chippewa who once lived along the beautiful peninsula of Vermilion's Wake-em-up-Narrows' north shore, Muskego Point Resort is an exceptional choice for your Minnesota getaway. It's important to spend some quality time with your family, and at Muskego Point Resort, you can enjoy a relaxing environment for all your family fun. Play a round of basketball or badminton onsite, take the kids out on their first fishing trip, or hike through some of the surrounding nature trails. In the evening, cook up a great family dinner on your charcoal grill! Muskego Point Resort is a place where you can leave your worries behind, breathe in the refreshing natural air, and indulge in life's simple pleasures. Settle into any of their 11 modern cabins that are ideally equipped with full kitchen, wood-burning fireplace, a screened porch or deck, and charcoal grill. When you're not relaxing in your home-away-from-away, venture out to discover the wonders of the area. Rent a boat onsite and spend a day fishing on magnificent Lake Vermilion, or lounge on the beach to work on your tan. Fishing is practically a way of life here. 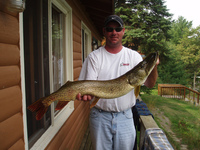 Muskego Point Resort's premier location on Lake Vermilion makes it a great choice for your fishing adventure home base. Teeming with walleye, muskie, northern pike, small and largemouth bass, sunfish, and crappie, there's no shortage of fish. If a family could envision the perfect cabin resort and make that dream a realty, it would probably look a lot like Brindley's! There's a nigh-endless number of ways for you and your family to enjoy Brindley's. There's 1300 feet of lakeshore, a sand beach, a 37 slip marina (featuring a concrete ramp to make launching and mooring boats safe and easy), and SO much more. When you're not in the water you'll be relaxing in your luxurious accommodations, or maybe you'll be exploring historic downtown Walker. Regardless of how you choose to spend your time, you can rely on Brindley's friendly staff to provide exceptional hospitality! The lodge is 15.3 miles from downtown Walker. Other amenities include fire pits, a game room and free use of canoes, kayaks, hydrobikes and bikes. Woodland Beach Resort is located on Bay Lake in Deerwood, Minnesota. With a wide variety of cozy cabins to choose from, and great access to not only Bay Lake, but several other lakes in the area, Woodland Beach Resort is a great destination for a relaxation vacation! At only two hours away from the Cities, Woodland Beach Resort is uniquely placed to offer both easy access, as well as that unbeatable North Woods feel. Whether you want to get out on the water and cast a line, or if you'd prefer to just lounge on the beach, build that sandcastle and work on your tan, you can do either one, and have a great time at Woodland. Plus, since you can rent boats for fishing, as well as pontoons, everything you'll need to have a great time will be ready and waiting for you. There's no better way and no better place than Woodland Beach Resort for the family vacation you'll never forget! Surrounded by the incredible Lake of the Woods, Arnesen's Rocky Point Resort is the perfect destination for a Minnesota family vacation. Here, you can leave behind all those pesky distractions and focus on reconnecting with your loved ones. A selection of charming cabins offer you all the space you need to unwind, along with plenty of amenities such as a complete kitchen, barbecue grill, and picnic table to make you feel right at home. Take in the stunning views of the Lake of the Woods from your private deck or porch, and catch up with your loved ones with a variety of activities. With their prime location on the south shore of the Lake of the Woods, Arnesen's offers a little of everything to make your family trip fun and entertaining. They have the largest protected marina on the south shore, along with available fuel, bait and overnight docking to make it easy to hop aboard and go for a cruise. Teach your kids how to cast their first line! The lake is teeming with walleye, northern pike, sauger and perch, so you're sure to reel something in for the day. Or, simply enjoy swimming and beach fun on their sandy beach area that's perfect for an afternoon of family fun. At the end of the day, settle down for a delicious meal at the Rock Harbor Lodge to top it all off! With over 70% of Lake of the Woods available for public hunting, Arnesen's is a great destination to set up home base for your hunting adventure. Full of waterfowl, deer, ruffed grouse, mallards, Canadian geese, and more, you're sure to bring home a great catch! Since 1897, the Arnesen family has inhabited Rocky Point. More than 100 years later, the family continues to provide guests with an incredible Minnesota fishing and nature getaway on the Lake of the Woods. Spend your time at Clearwater Lodge, and you'll have lots of great ways to enjoy the beauty of the Boundary Waters Canoe Area. With easy access to several trails, including Daniels Spur Trail, Caribou Rock Trail Loop, and Magnetic Rock Hiking Trail, you know you'll have plenty to enjoy! The Boundary Waters Canoe Area is one of the most beautiful areas in all of Minnesota, and when you stay at Clearwater Lodge, you'll have unparalleled access to it, and to the surrounding area. So whether you want to hike through the area, taking in the beauty of the land, or you want to explore on the waterways, Clearwater Lodge can outfit you when everything you'll need to make the most of your vacation! This is a destination and a lodge you'll never forget. Make great memories the family will cherish always, at Clearwater Lodge! The Boundary Waters Canoe Area is over 1 million acres! To fully enjoy your time, boat rentals are available. There are: solo, tandem, 3-man and even 4-man canoes available along with kayaks, paddle boats, 10 hp motor boats, and stand-up paddle boards! A family vacation at Anderson’s Starlight Bay Resort is a commitment to fun. It’s a promise to your family that says “This isn’t gonna be just the run-of-the-mill family trip”. Believe us, that promise isn’t going to be broken. Just south of the quaint town of Nevis, sitting adjacent to beautiful Crow Wing Lake, sits Anderson’s Starlight Bay Resort. There you and your family will find unbridled hospitality, luxury accommodations, and fun up the wazoo. From the cozy interior of your cabin, set out and explore your gorgeous surroundings. As the knowledgeable staff will tell you, “It is mostly wooded with a trail system that hosts a never ending scavenger hunt and the opportunity to see many species of songbirds, turkeys, eagles, deer and other small woodland critters”. Your family will absolutely love it. Crow Wing Lake is 378.45 acres. The northern pike, walleyes, and the largemouth bass fishing is second to none! If you're itching to show your family the joys of a day spend fishing on the lake, there's simply no better place to do so than Rusty Moose Resort! Widely considered by anglers to be one to the top producing lakes in the state of Minnesota, Lake Miltona makes for a superb backdrop. Its 5800 acres of spring fed waters and seven miles of shoreline give guests ample opportunity for catching the big one, whether you prefer plopping down in the middle of the lake or prowling the shallows. Of course, when you're not fishing you'll be relaxing in your multi-bedroom cottage, enjoying the air conditioning and catching some well-earned z's. There's also a spacious swimming beach and park-like grounds, allowing family space to make their own kind of fun! Rusty Moose Resort is 10 miles north of Alexandria and only a couple hours from the Twin Cities and Fargo. There's free Wi-Fi, plus onsite boats, motors, gas, and bait! With a sizable collection of superbly decorated vacation homes and rentals, BlueWater Lodge is an ideal destination to bring your family any time of year! Minnesota's glorious northlands are overflowing with opportunities for adventure and fun! Kayaking, canoeing, hiking, and so much more are stupendous ways to spend a weekend afternoon, and you'll make countless memories exploring the beautiful area. The nearby town of Walker is the quintessential up-north town, superb for both shopping and fishing (whichever "floats your boat"). Properties are spacious and full of northern charms and amenities. And of course, you always have access to BlueWater Lodge's famous hospitality!